“I’m happy to be back,” says Monica, Coney Island’s High Striker Queen, who has a new spot on the Bowery under the famed Wonder Wheel’s Thrills sign. And we’re happy to be reporting the good news. In photos taken earlier this week, Monica and her partner Jeff were overseeing construction of their new Fishbowl Game. It will officially open this weekend along with a Kiddie High Striker and Basketball Game. As ATZ reported in March, three weeks before Coney’s March 26th Opening Day, Monica was told by a rep of 12th Street Amusements that she could not set up this year. “I’m heartbroken,” she had told us. “If I can’t find another place, I’m going to leave Coney Island for the last time.” The space on the Bowery became available for lease after longtime indie operator Jimmy Carchiolo aka Jimmy Balloons, passed away in April. Coney Island’s High Striker Queen was the first victim of the City’s scheme to use eminent domain to acquire six privately owned lots for “the revitalization of Coney Island.” One of the lots is the location where Monica and her partner Jeff ran their popular Mom & Pop “hit the hammer, ring the bell” game for the past four seasons. 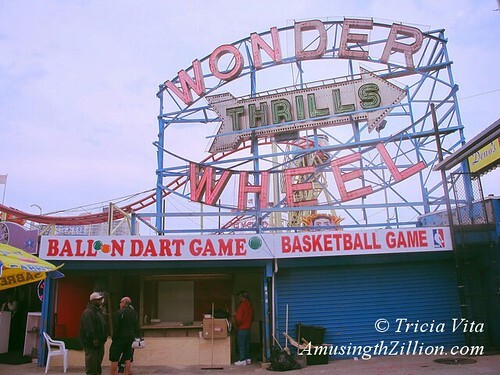 A few weeks ago, 12th Street Amusements set up their own game in Monica’s former location, which means that when the lot is finally acquired by the City to make way for Wonder Wheel Way, they would be the ones entitled to compensation.